The back's plain, because it'll be against the fence on Tom's line. Not a direct copy - but I am tempted to spray the finished thing bright yellow! Although I never expected anything in return for helping Andrew isn't this a great example of the barter system! The building reminds me of the Hornby model Andrew mentions which I had a couple of as a kid on my OO gauge railway. Please don't paint it yellow! Andrew's one looks much nicer than the Hornby one! I'm always amazed at what can be done in larger scales using foam-board and plasticard and similar stuff. The building already looks somewhat real, because of its pleasing proportions. It ought to look very nice on your little railway, Tom. My wife's away this weekend, so the kitchen table's covered in tools, materials and half-finished models, and the air stinks of glue - it's a glimpse of the chaos I'd live in if I wasn't married. The upside of all this chaos is that I'm getting some modelling done - starting with Tom's building. Don't worry Tom, only kidding, I got that ages ago for another project... Actually I think painting's going to be a while off yet. There's not much more to do, just the roof and a little tidying up, but painting will have to wait for better weather. Looking better and better, Andrew. How have you done the shiplap cladding? I absolutely agree with that, it is a lovely structure with great character. Tom should be delighted to receive his surprise.... Shhhh....... don't tell him! My wife's away this weekend, so the kitchen table's covered in tools, materials and half-finished models, and the air stinks of glue - it's a glimpse of the chaos I'd live in if I wasn't married. I would be the same! The station looks great and I am very grateful for you taking all this time to make it. I don't expect you to paint it as well though so send it on when you are happy and I will finish it. If you really must paint it yellow though for kicks do it once and then undercoat it in another colour please! If you really must paint it yellow though for kicks do it once and then undercoat it in another colour please! Ooooo..... that's so tempting, and we would all love to see it! I'll see how I get on, and what the weather does, I rather like the painting part of things (it brings out the characyer...), so I'll keep hold of it for now- unless you've got a burning desire to paint it Tom? Please feel free to paint, no rush! 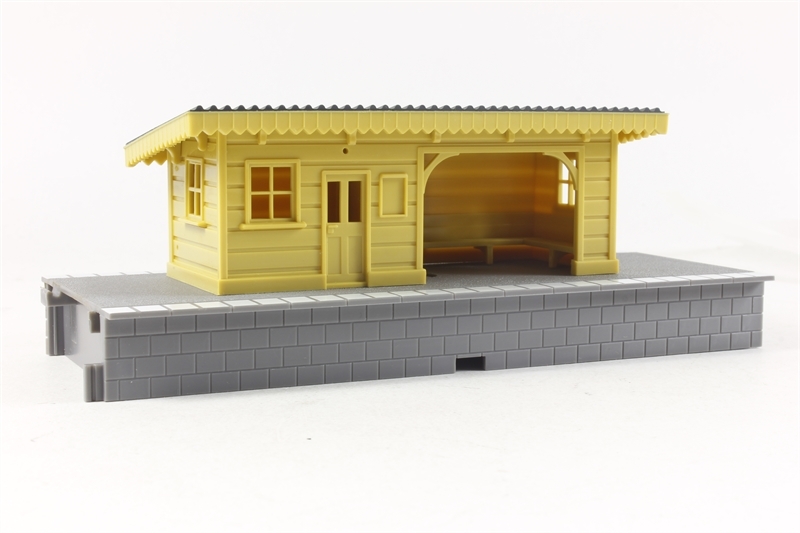 I really love the little station Andrew, the colour at the moment looks good enough or something similar, but yellow is what we all want to see. Love the veranda work on the roof, are you going to put a light in it. Also mate what did you use for the doorknob, or did you buy it.